“Around 1800”—Anglo-Americans pushed into the frontier, settling in East Texas and across the Red River, not settlers as much as hunters, trappers and the likes of Phillip Nolan who came to gather wild horses and ship them east. 1818—Cherokees arrived, settling between the Trinity and Sabine rivers, north of Nacogdoches. January, 1821—Colonization by the Spanish: Moses Austin applied for and received an empressario grant to settle 300 colonists, what Texans call “the ol’ 300”; more than 25 empressario’s received grants. June, 1821, Moses Austin died. December, 1821, first 300 colonists arrive. 1830—Mexico banned further immigration; ban failed. 1832—Committees of Correspondence organized at the Convention of 1832, organizing for self-government. Oct. 2, 1835, Texans challenged Mexico’s troops with “come and take it” over a cannon at Gonzales, TX. October 1835, colonists gathered at Washington (on-the-Brazos) in convention. 1836—35,000 lived in Texas; chafed at requirements or ignored them. March 2, 1836—Declaration of Independence signed at Washington. March 6, 1836—Alamo fell to Santa Anna’s army. —Sam Houston, given command of the Texas army left convention. March 11, 1836—Houston starts organizing troops at Gonzales. Mid March, 1836—David Burnett named interim president. —Lorenzo de Zavala named vice president. March 27, 1836—Palm Sunday, Texas troops marched out of Goliad and executed, result of Santa Anna order. May 14, 1836—Santa Anna signs two peace treaties with the new republic; one public, one private; the Rio Grande the southern boundary of Texas. Sept. 5, 1836—Sam Houston defeats Stephen F. Austin and Henry Smith for the office of President of the Republic of Texas; he is inaugurated, Oct. 22 for one, two-year term. Dec. 1836—Stephen F. Austin, the “Father of Texas,” depressed from defeat, then dies of pneumonia. 1838—1841–Mirabeau B. Lamar succeeded Houston as President; Lamar opposed Indians and annexation to the U. S.
July 1839—Cherokees removed from Texas. 1841—Houston returned to the presidency. 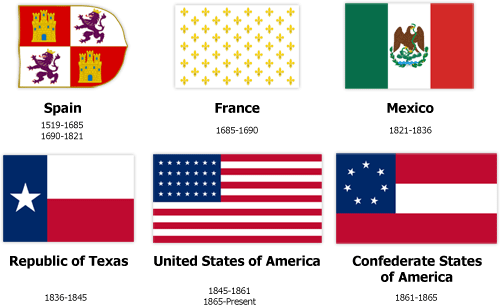 April 11, 1844—Annexation Treaty–signed under Houston with the United States. 1844—Anson Jones succeeded Houston as Texas’ president. February, 1845—U. S. Congress approved annexation resolution. July 4, 1845—President Jones calls convention to write a state constitution. Feb. 16, 1846—Texas’ first state legislature meets. 1859—Sam Houston elected governor of Texas; refused to call for a secession vote. Feb. 23, 1861—Secessionist leaders called for secession vote; 76 percent voted to secede. May 13, 1865—last battle of Civil War fought at Palmito Ranch near Brownsville. June 19, 1865—Gen. Gordon Granger, under command of Gen. Philip M. Sheridan, arrived in Galveston with 1800 men to begin Union occupation, the Reconstruction era. — Emancipation of slaves proclaimed by Gen. Granger. By January 1874—Reconstruction ended; Richard Coke elected governor; Democrats back in control of state government. Paleo-Indians, big game hunters, a small nomadic culture. End of Ice Age changed Texas’ climate about 7,000 years ago. Pre-Caddoan tribes settled in East Texas in villages, building mounds for burials and rituals. The Caddoes, a civilized group, with well-defined social stratification emerged. Caddoan Mounds State Historical Site near Crockett, preserves a mound built about 1,000 years ago. 1519 Capt. Alsonso Alvarez de Pineda, serving the governor of Jamaica, mapped coastal Texas. 1530’S—Cabeza de Vaca to explore Texas; shipwrecked on the gulf coast. 1540—Francisco Vazquez de Coronado—commissioned to explore the American Southwest; he searched in vane for gold and silver across the High Plains of Texas, Oklahoma and Kansas. Armament and weapons from his expedition found in a cave in recent years is on display in Floydada, TX. 1542—Luis de Moscoso Alvarado explored from the east and ventured into Central Texas. 1580’s—Fray Augustin Rodriguez, a Franciscan Missionary, and Francisco Sanchez Chamuscado, a soldier led an expedition into Texas and New Mexico—Presidio and present day El Paso. 1620’s Frays Juan de Salas and Diego Lopez lived with the Jumanos near present day San Angelo, providing religious instruction. 1682, Rene Robert Cavelier Sieur de La Salle, explored the Mississippi River South to the mouth at the Gulf of Mexico, claiming territory for France. 1684—He returned with four ships and colonists to settle the claim. Missed the Mississippi by 400 miles and sailed into Texas’ Gulf of Mexico. 1687—La Salle led expedition up the Trinity River, murdered en route by his men. 1689—Spain sent Capt. Alonso de Leon, governor of Coahuila, into Texas to confront the French. He traveled east from Eagle Pass to the remnants of Fort Saint Louis. 1718—Mission San Antonio de Valero (later called “The Alamo,”) established at present day San Antonio, then San Pedro Springs. 1731—colonists from the Canary Islands arrived and founded the first “civil jurisdiction” in the province, San Antonio. 1795—A census “found 69 families living on 45 ranches” around San Antonio. 1803—Census reported 100,000 head of cattle in Texas and few additional families in Nacogdoches and La Bahia (near present day Goliad). Thanks to the Texas Almanac, 1857-2007 for this information and so much more; a terrific reference about Texas’ history, politics, economy and geography as well as current facts on cities, towns and counties.